HaxeFlixel. Paint.NET/Pinta. Audacity. Hands, arms, maybe even feet. General premise of the game: You have to catch the blossoms (by tapping on them I guess) and use them to hit birds which are flying in from the left. One hour left – roll on LD32! Once upon a time, in December 2013, there was a game-dev competition called Ludum Dare. Our brave and noble protagonist thought, “Sure, why not, I’m in!” And he made a little one-button flash game about gravity. Having done reasonably well in the ratings (top 40 for innovation), he thought “Hmm, I could remake this better!” And so he did. Over… and over… again. Until one day… he declared it good. 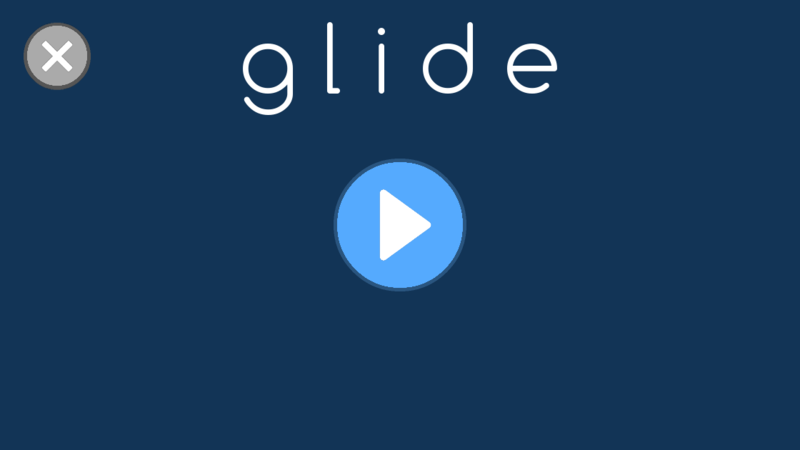 That day was today, and Glide has finally been released for FREE on the Google Play Store! Glide is a laid-back, minimalist game about controlling gravity in order to get home – and I’m so proud that it’s done. Looking forward to some mad gamedev times! For me, LD28 was the best Ludum Dare I’ve had. Even though it was about 2 months ago, I’ve only just got round to putting the post-compo finishing touches onto my game. 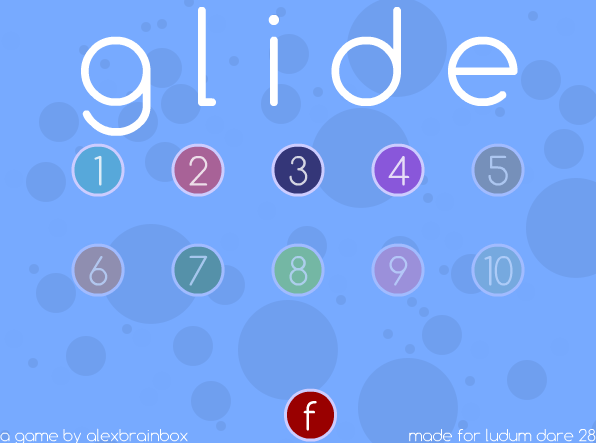 I ended up building a game, Glide, which I’d had the idea of for a while. Sadly I’m fairly unmotivated at the best of times, but Ludum Dare is always capable of getting me into action! The basic premise is that you use the single control (spacebar) to switch “gravity” on and off. Technically it’s not quite an implementation of gravity, but we’ll get to that. The game only has ten levels at the moment – this was partially due to timing constraints during LD28, and partly due to my inability to come up with new levels – but most of all, it seems that hardly anybody actually plays through to the end of the game anyway. The aesthetic – I was incredibly happy with how the look and feel of the game turned out. Despite some lag issues on Firefox and on slow browsers, play seemed to be generally quite smooth. Feedback assures me that the way the game played was consistent and this helped it to stay fun. The idea – For once, I was actually able to reap the benefits of a Ludum Dare idea which was easy to implement. I cannot overstate how useful this was in enabling me to create what I feel is a “good” game during the short amount of time available. I knew I was in with a hope when the raw game was almost completely implemented by the end of Saturday night. The curve – I have heard from quite a few people that the difficulty curve was way off. I think this can be put down to the fact that I have little experience in level design, almost all of my previous games having been arcade-style procedurally generated gameplay, rather than pre-built levels. More time would have enabled some more detailed level design and if I build more levels then this is certainly something that I will take into account. The assets – The lack of music in the game felt a little off and it’s possible this is one of the reasons many people didn’t stick around in the game. Since the compo has ended I’ve added some fantastic music from the equally fantastic Kevin McLeod, and it’s improved the aesthetic greatly. The name – I should have absolutely checked that the name Glide was available on my Flash portal of choice (Kongregate) before embarking. Sadly, it was taken, and so I’ve had to release under the name GraviGlide on Kongregate. All in all, I’m really happy with how Glide turned out. If anybody feels like giving it a go (and I’m still incredibly open to constructive criticism), and/or giving it a fair rating, I’d be more than chuffed! You can find it here. I spent far too long doing nothing at all on Saturday and Sunday both, but I’m certainly happy how it turned out. Note to self: Simple works well. Also start earlier than 2pm on Sunday! I’m going to improve the game and upload the new version to Kongregate, and then quite possibly end up porting it to Android (using HaxeFlixel). Good times! All in all, going fairly well so far! My game, Glide, is about using ‘gravity’ to slingshot around bodies to get to the goal. Click the screenshot to try it out on my site (it’s signposted!). I expect to be fully done by the end of the 48 hours, with a set of 15 or so levels. I’m pleased with the level of fidelity it has so far, but some form of ambient music and a little bit of MINOR ornamentation in the levels and menu certainly wouldn’t go amiss. And so, in the messy cavern I call my room, the 48 hour fun times that are Ludum Dare begin once more. I’ll be competing using Flixel on AS3 (as usual) and probably BFXR. My tactic this time round is to make something which requires as little graphical fidelity as possible, and then add trillions of particle effects. It’s time to do this, guys. Your old pal Alex is in! I’ll be using Flixel, compiling to Flash (naturally). My game, during development, will be hosted here. As part of the competition, I’ll be constantly in the IRC, both giving people my latest versions to try out (when I think something is cool, and not before! ), and doing a digest on Saturday and Sunday night. Am I cool yet? I wish everybody the best of luck in the competition and look forward to seeing a variety of games! So after 2 hours of solid rushedness and brain melting agony, we have here a finished game! Long story short you have to match up the DNA bases in order to further extend the molecule and become a god, or something. I might have hallucinated the last part, it’s been a long evening. I’d be grateful if you would play and rate it! I’ll be writing in AS3/Flex with the ever-brilliant Flixel for my library…. Zero ideas about what to make, but I guess that’s good because I won’t be inclined to match the theme to my idea rather than fitting the theme around a pre-existing idea. Good luck to everyone competing. May the odds be ever in your favour. So, the theme ‘Alone’ was a right kick in the proverbials.. I didn’t think anyone would vote for such a bland theme that’s clearly angled towards artists rather than programmers, but oh well. I’m thinking of just making a tower defence game or something, seeing as I haven’t done one before, but I may not submit it, we’ll see how things go. Thought I’d come along for the ride once again. Fingers crossed I’ll actually produce something vaguely fun this time around (as if)! So I’m entering this time round, and it’ll be my second forty-eight hour stint, the first having been LD #20. Any extra tech: sfxr, probably. Theme is war, so plenty of routes to go down there. At present I’m thinking sneaky-stabby-spy game, and the idea seems to work out alright in my head. But then again it always does, right? If you want to play, you can find the game here. The walk-through is available here. 31 queries executed in 0.127 seconds.